In the wake of the June 17 mass shooting in a Charleston, S.C. church, Fox News contributor Erick Erickson claimed that Americans can no longer distinguish "normal from crazy and evil from good," citing society's acceptance of transgender people like Caitlyn Jenner. On the June 18 edition of The Erick Erickson Show, and in an accompanying blog post on RedState.com headlined, "The Conversation We Won't Have," Erickson denounced the "political" conversation in the wake of the attack that killed nine people, and criticized what he called "cries from the left" about racism and gun laws. He lamented that "as a nation, when these things happen, we never have the conversation about real evil. We also never have the conversation about mental health:"
As a nation, when these things happen, we never have the conversation about real evil. We also never have the conversation about mental health. For that matter, we don't have honest conversations about why some kid in Minnesota or Alabama would want to go join ISIS and kill their fellow citizens or why some kid would want to join neo-nazis or a gang. Instead, we descend into partisan conversations where everything is political and neither side can concede or acknowledge the other's points. Everyone and everything gets blamed while ignoring the actual person who killed. I realize now why that is. I realize why we will never have the conversation we should have. A society that looks at a 65 year old male Olympian and, with a straight face, declares him a her and "a new normal" cannot have a conversation about mental health or evil because that society no longer distinguishes normal from crazy and evil from good. Our American society has a mental illness — overwhelming narcissism and delusion — and so cannot recognize what crazy or evil looks like. While Erickson is the first Fox personality to link Caitlyn Jenner to the Charleston shooting, his comments are part of the larger effort by conservative media to steer the public conversation about the massacre away from the underlying factors of racism and gun laws. 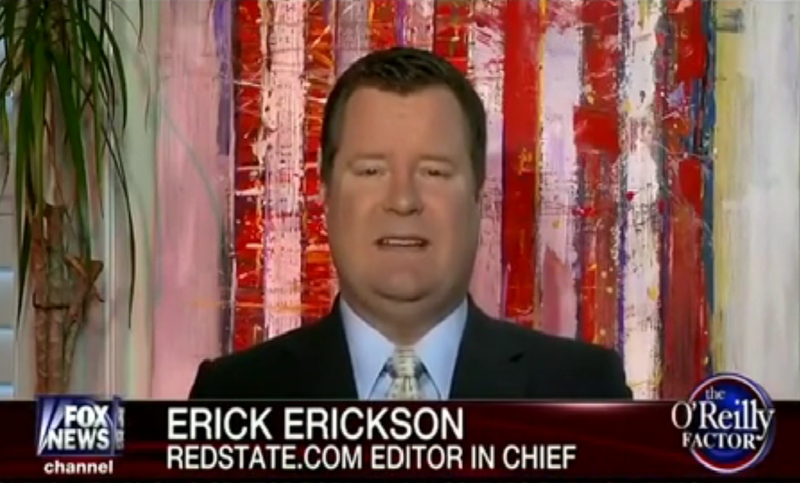 Fox's Erick Erickson: The Only Line Between "Gay Rights Extremists" And "Islamic Extremists" Is "Death"